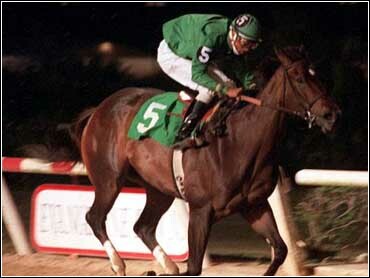 Hallowed Dreams failed in his bid to become the first horse to win 17 straight races, losing Saturday night in the Millennium Stakes at Evangline Downs. Hallowed Dreams bobbled after the start, and jockey Sylvester Carmouche had to hustle her back into contention, but the speedy filly faltered badly to finish third behind Sparkles of Luck. "I felt we were in trouble early. But when we turned for home, I knew we were beaten. That's horse racing," Carmouche said. Sparkles of Luck ran six furlongs in 1:10 4-5. "I knew I had about the best shot to beat the filly, and my filly ran a perfect race," jockey Gerard Melancon said of Sparkles of Luck. Ides Beware finished second in the $36,500 race.